| Next: Can't wait for the chow-dah!! | Next: Who's gonna be ride number two? Where is the old Hampshire? Man it felt great to take that seat belt off as we crossed over the NH state line. So much freedom. Looking for rides in the Maine or Vermont area tomorrow. Let us know if you have one. Lee was awesome. He took us from Boston to Concord and we had some good laughs. 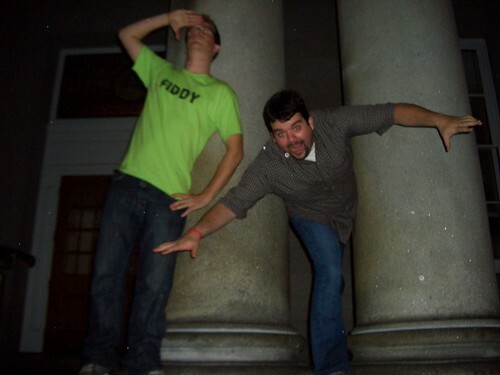 Here's Fiddy and Lee in front of the Concord State Building. I wish you good luck ! To quote Wikipedia "(old) Hampshire, sometimes historically Southamptonshire, (abbr. Hants) is a county on the south coast of England in the United Kingdom." There you have it. Good luck guys! Do you think once you're finished you can hitch hike to Ireland? Check out my blog, to read about my adventures...you can even stay with us! where? it's a county in England (the United kingdom!!) !!! geography not your strong point gentlemen? lucky someone else is doing the driving Huh!??!! I thought perhaps some of us might enjoy looking at a real-time satellite map of your whole trip as it unfolded. Hopefully I’ve gotten your routes and the stops at least close to being right from reading your previous entries. You don't need your seatbelts in Virginia either, as long as you're in the back seat.... so get ready for more freedom if you're back-seating it through VA baby! Old Hampshire is actually Hampshire England. Most of the towns New England states were named after places and towns in Great Britain. Can't wait for the chow-dah!! Who's gonna be ride number two?